Note: Plot points from last night’s episode of The Walking Dead are discussed below. Another mid-season finale, another name character meets their inevitable fate on The Walking Dead. 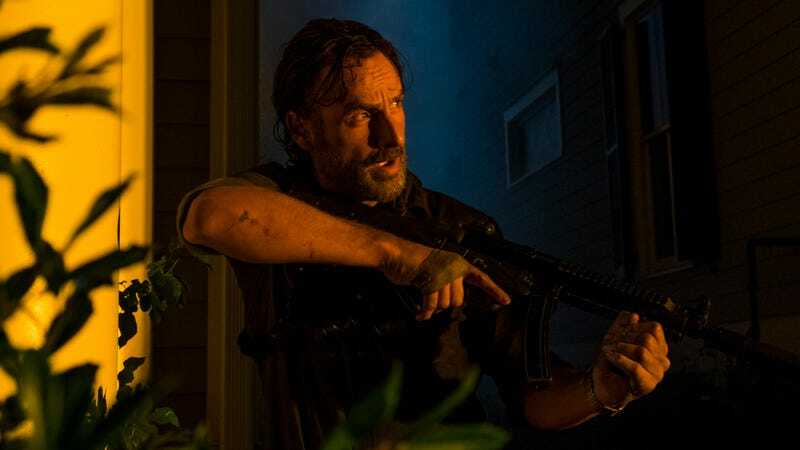 As is covered in our review of the episode, last night put the final nail in the coffin of Carl Grimes, with the final moments of “How It’s Gotta Be” revealing that Rick’s son was bitten by a walker prior to his escape from Alexandria. He’s still alive for the time being, but he’s a dead man walking. (Plus, there was a lot of foreshadowing suggesting Carl was bitten even before Negan and company showed up to burn Alexandria to the ground.) Showrunner Scott Gimple implies that Carl will be around for at least one more episode—“I’m just focused on the fact that Carl right now is alive and he has some business to attend to,” Gimple said on Talking Dead—but his death fulfills the requisite “big character death” that has come to define these finales, both mid-season and the actual last episode of the year. And that’s the problem: We know exactly when big deaths are going to happen. These finales have become the ritual bloodletting of any credits-listed characters, the traditional moment in the season where the audience knows someone is going to die, and the series delivers. From essentially the moment Andrea died at the end of season three, the show has delivered these deaths like clockwork, reliably killing off someone of note during these biannual finales with rote predictability, to the point where “Who’s going to die this episode?” has become a routine guessing game, albeit an entertaining enough one. Sure, there are slight tweaks to the formula (someone’s dead, but you’ll have to wait until next year to find out who! Carl’s not dead yet, but he’s bitten! ), but these are less variants than confirmations of this apparently firm rule. And while it lends a bit of wait-for-the-other-shoe-to-drop frisson to these finales, it’s also the death of surprise. For the first few years of the show, The Walking Dead drew a lot of storytelling force from the “anything can happen at any time” mentality. It’s the zombie apocalypse, for god’s sake, so unpredictability should be a central theme of the narrative. And for awhile, the series could take us off-guard: Shane becoming unhinged and then getting shot by Carl prior to the second-season finale, Lori dying in childbirth four episodes into season three (with T-Dog dying the same episode! )—these were shocking and well-orchestrated storylines, fully justified by the narrative and dropped at scattered moments throughout the show. They weren’t just rote murders, provided because the audience expects a noteworthy death twice seasonally. The Walking Dead has only itself to blame for the decision to make significant character deaths a predictable event. It painted itself into a corner by making those built-in killings a known feature of the series, rather than continuing to keep the audience on its toes with interesting and untimely losses. This is a show about humans scrambling to survive in a world where death constantly beckons, both from zombies or—as in the case of the past year or two especially—other people. By making death a regularly scheduled occurrence, it has sapped itself of the capacity for real surprise, instead embracing a formulaic approach to a story that should be anything but. But there are plenty of series out there doing daring, innovative storytelling, and there’s no reason The Walking Dead should feel the need to adhere to the rigidities of formulaic tradition. It’s literally one of the biggest shows in the world; no one’s going to stop the series from messing with its format, should it choose to get a bit more ambitious. I still enjoy watching The Walking Dead. I only wish I respected it a bit more.